A personal blog about the search and hunt for GOLD on the East Coast of the United States. I'll try to cover places to go, tips, equipment, and clubs especially related to the eastern gold prospecting. The 2018 Gold Prospecting season is upon us. Time to start gathering gear, organizing, and planning this years trips. I personally, am planning my annual Fathers Day trip to North Carolina. I'll either go to the LDMA (Lost Dutchman Mining Association) Vein Mountain Camp, or Lucky Strike Gold Mining Camp. Later today, I hope to update the North Carolina page with information I know of. We're still starting out, and building the network out. As always, if you have places to share, feel free to submit details on the right. Hi Everybody. Since I started this site, I've been concentrating on other things a bit. But I'm returning this year to try and build up the resources for people. If you have information you'd like to add, feel free to submit on the right through the quick comment form. I'm looking to include any information about Gold Prospecting on the east coast. In particular, I'm interested in links to Clubs, Camps, and Museums and other points of interest. The more information the better. This 15" pan is ideal for panning gold, silver, or precious gems with its reliable, rapid gold recovery system. Its deep, wide riffles (measuring at 1/2" deep) are effective for retaining fine material as well as larger nuggets. Made from durable plastic. Works wet or dry. The forest green color provides contrast and will therefore reveal gold better. This was one of my first pans and I used it to teach myself how to pan. The HUGE bottom makes it easy to backwash and rinse back the black sands. The super deep riffles help keep more of the gold when your washing out material. The biggest downside is the fact is it's a very durable and heavy pan, so if your wrists get tired easily, you may have to take frequent breaks. Lol. Still number #1 pan that can be used for just about any purpose. Authentic, spun copper gold pan. These pans are made from solid copper sheet right here in the USA. 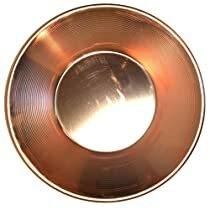 10" diameter, heavy duty solid spun copper gold pan. Beautiful decorative piece, add some engraving for a handsome award or trophy or go panning for gold. This is real copper and will patina with time, about as authentic as it gets. 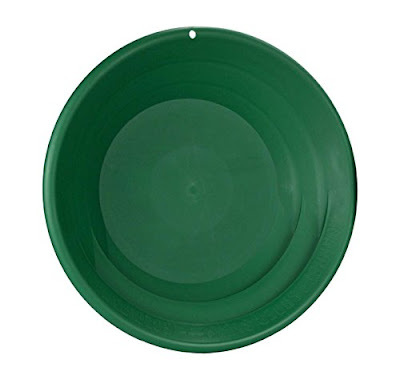 The inside bottom diameter is just over 5.5" and the pan is roughly 1.75" deep. After a couple of years panning experience and testing many other different pans, I decided to buy a real metal pan out of nostalgia. The first thing I had to was remove the manufacturing grease coating the pan with a good detergent. After that I decided to age the pan, using vinegar water. It turned out a beautiful beige/brown color. One thing you will notice is this pan does not contain any riffles. It's definitely for advanced panners, who are sure of their skills. As a general rule, you have to go slower, and wash out less material between steps. But, I tell you, there is nothing like holding a quality metal pan. The weight and balance is perfect. Now, to be honest, this is not a pan you would normally take out to pan a creek (unless it's all you have). But, I find it perfect for sitting down and doing my clean-ups, or just relaxing on a beautiful day panning out a bag of paydirt. The turbopan was invented to quickly & easily pan gold. 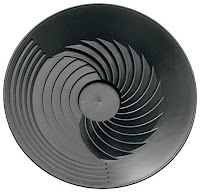 it will reduce your panning time by at least 50%, due to the "Vortex action" & the amount of riffles in the pan. it also acts like a sluice box, but in pan form. No other gold pan is faster! I was skeptical, I admit it. I also have the LARGE version, which I like as well. But this pan is amazing, fast, and gets the gold. Besides the copper pan for nostalgia, this is by far my favorite clean-up pan. It's super light weight, holds plenty of material, and the deep center concentrates and keeps the gold in the pan. Since I live in Virginia, I'll start off blogging about places you can visit or go here, and eventually branch out to other states I've been, or plan on going to. As you can see on the map, there is a gold and pyrite belt that travels from the north-east to the south-west of Virginia from the Maryland border, and runs through to North Carolina. The dots on the map are just some of the known old mines throughout the state. For starters, in Southern Fauquier County, is the "GOLD MINING CAMP MUSEUM" at Monroe Park. A little known fact is long before the big "Gold Rush" out west, was the East Coast Gold rush. You can visit and get a tour and see what it was like to live and work in a gold mining camp. Around the town of Goldvein, Virginia there are also about 19 or so old abandoned Gold Mines and prospecting pits. Throughout most of Fauquier County streams, creeks, and rivers you can find gold. Of course, always be sure to ask the owners before crossing private property to get to a creek to do your prospecting. The Contrary Creek Prospecting Lease is a recreational gold prospecting lease on the private land encompassing Contrary Creek close Mineral, VA. The rent started in 2008 and has given stewardship to various land proprietors while strengthening mindful gold prospecting exercises. Another good site for information is Virginia Gold Mines, Prospecting, Panning, Treasure Hunting and Rockhounding at goldmaps.com. Virginia DEPARTMENT OF MINES MINERALS AND ENERGY also has an excellent set of online resources and maps. So you want to find gold on the east coast? Hi everybody. Since one of my favorite hobbies is gold prospecting, I figured I'd start a blog dedicated to it. I also have my personal blog over at www.braggfamily.com, but will dedicate this one to my adventures and information about searching for the ever illusive GOLD we all love. One of the biggest questions I originally had, was; is there really gold still available on the east coast. And the answer is .. DEFINITELY. Nearly every state has gold, with the exception of maybe Florida. The focus of this blog will be the East Coast of the United States, because that's where I live and it's difficult for me to travel out west. I know others have similar thoughts and the same travel problem. I'll try to cover locations on the east coast, clubs to join, an occasional gold recovery product, paydirt, or anything that comes to mind. they sell at your local home improvement stores, a gold pan, some paydirt, and start panning. © 2017 East Coast Gold Prospecting. Simple theme. Powered by Blogger.